I held this item for a couple of days after I found it because I didn't want to spoil Christmas. Readers can fairly criticize me for waiting. Harare, Dec 10, 2008 / 08:01 pm -- Caritas Internationalis is warning that the crisis in Zimbabwe is so grave that people facing crushing food shortages are mixing cow dung with their food. With pressure continuing to mount on President Mugabe to relinquish his hold on power, Zimbabweans are suffering the consequences of his government’s policies. Besides the lack of food, people are also suffering a cholera epidemic and crippling hyperinflation. Caritas Internationalis Secretary General Lesley-Anne Knight reports that "people in Zimbabwe are dropping dead on the streets from Cholera. They’ve witnessed people mixing cow dung with what’s left of their food to make it go further. This is poverty at its most dehumanizing." ..... A Caritas survey in October found 70 to 90 percent of households going hungry and the remainder on the brink of starvation. At least 5.1 million people are facing starvation out of a population of 13 million people. Additionally, nearly 14,000 cases of Cholera have been reported. Knight also commented on the political crisis, saying, "Zimbabwe’s political impasse can continue no longer. An effective government that can rectify the policies that have put the country into this position must be established. Zimbabwean President Robert Mugabe said Tuesday the U.S. and Britain are "stupid" to think he shouldn't be part of a unity government. The top U.S. diplomat for Africa said over the weekend that Washington can no longer support a power-sharing proposal that leaves Mugabe president, and Britain's Africa minister backed the U.S. stance on Monday. ..... (Mugabe) has faced renewed criticism because of a humanitarian crisis that has pushed millions of Zimbabweans to the point of starvation and spawned a cholera epidemic that has killed more than 1,000 people since August. Food, medicine, fuel and cash are scarce. 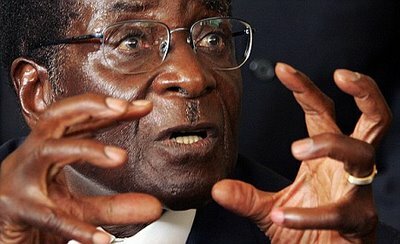 Critics blame Mugabe's policies for the ruin of what had been the region's breadbasket. Mugabe blames Western sanctions, though the European Union and U.S. sanctions are targeted only at Mugabe and dozens of his clique with frozen bank accounts and travel bans. A Zimbabwean peace activist held in an alleged plot to overthrow President Robert Mugabe has gone missing again, a leading human rights lawyer said Thursday. Human Rights Watch called for the immediate release of Jestina Mukoko saying the charges she faces "seem politically motivated." ..... Mugabe has faced growing pressure to step down. Charging Mukoko, the respected head of a group known as the Zimbabwe Peace Project, is a sign he is not prepared to yield after nearly three decades in power. ..... Mugabe, 84, has ruled the country since its 1980 independence from Britain and refused to leave office following disputed elections in March. Food, medicine, fuel and cash are scarce in Zimbabwe, and critics blame Mugabe's policies for the ruin of what had been the region's breadbasket. Mugabe blames Western sanctions, though the European Union and U.S. sanctions are targeted only at Mugabe and dozens of his clique with frozen bank accounts and travel bans. ..... Millions of Zimbabweans are in need of food aid and a cholera epidemic has killed more than 1,100 people. You see that CNA unequivocally pointed to "the consequences of (the Mugabe) government’s policies." But AP gave him undeserved wiggle room two separate times. CNA reported that cow dung has become part of many Zimbabweans' diets two weeks ago; though it should know of this situation, it appeared nowhere in either of AP's reports. CNA cited "at least 5.1 million" facing starvation two weeks ago; AP only told us of "millions ..... in need of food aid," which I believe most people tend to think of as "two or three." To its credit, AP does have a month-old video on how many Zimbabweans have resorted to eating crickets, rodents, and termites to stay alive. But the video can only be found at AP's home site; readers at other sites carrying AP reports will have no idea of what Zimbabweans have to do to keep from starving. Coverage of the true extent of the crisis in the rest of the press has been scant. Seven of them go to a December 12 Bloomberg News story where Mugabe denied the existence of cholera. Two go to WorldNetDaily on December 21, where commentator Barbara Simpson quotes a doctor-priest who says that "the situation has reached 'Auschwitz proportions.'" All other search results are from foreign or relatively unknown sources. The same search at the New York Times came up empty. The Washington Post? Nothing. LA Times? Nada. Maybe the Catholic News Agency should become the real "Essential Global News Network" that the Associated Press only pretends to be. It's obvious if you compare CNA's two-week-old story from Zimbabwe with the two recent ones from AP that the wire service isn't up to the challenge of telling us what's really happening, and will, even as people die by the thousands, sanitize what it tells us based on what appear to be inexplicable sympathies.